When the U.S. Coast Guard absorbed the Bureau of Lighthouses on July 1, 1939, Juniper, a 177′ all welded steel buoy tender, was under construction and plans for a successor were on the drawing board. Plans initiated by the Bureau of Lighthouses called for the construction of several identical buoy tenders to replace existing coastal buoy tenders. 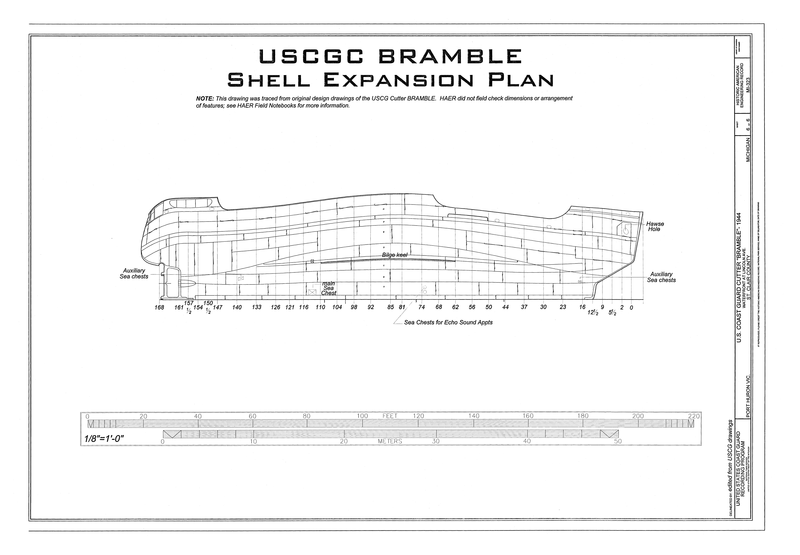 The preliminary designs generated by the Bureau were for a vessel similar to Juniper. 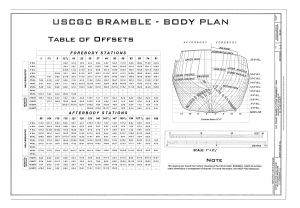 When the Aids to Navigation (AtoN) system transferred to Coast Guard jurisdiction, USCG planners reviewed the preliminary plans for the new class of buoy tenders and modified them to meet the service’s multi-purpose role. To be an effective part of the Coast Guard the new buoy tenders needed to be multipurpose platforms. They had to be capable of conducting Search and Rescue and Law Enforcement missions as well as their primary AtoN mission. 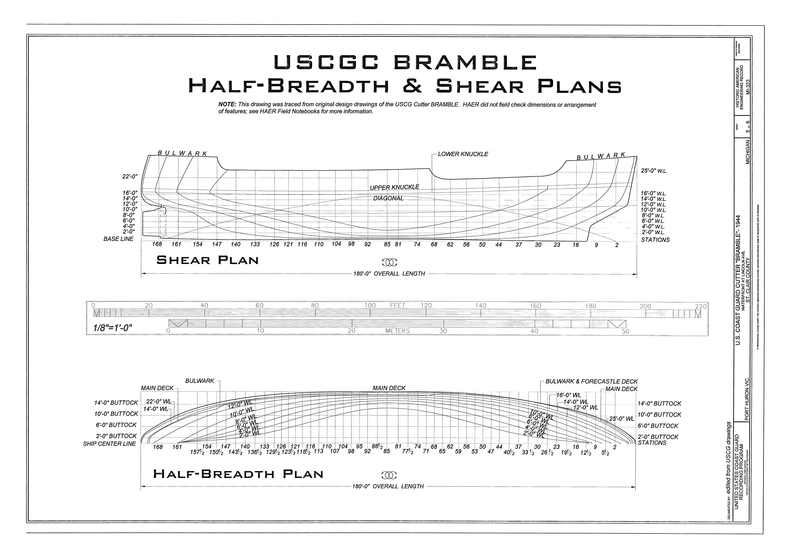 On January 20, 1941, the U.S. Coast Guard contracted Marine Iron and Shipbuilding Company of Duluth, Minnesota, to build the design based on Juniper and modified to meet the service’s requirements. On March 31, 1941, Marine Iron and Shipbuilding laid the keel for the first vessel of the new buoy tender class. The new vessel measured 180′ overall and had a beam of 37′ at the extreme. 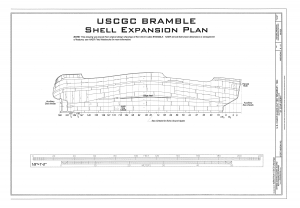 She had a displacement of 935 tons and drew 12′. The new design was similar to Juniper in appearance but did exhibit some important differences. Gone was the turtle back forecastle. A notched forefoot, ice-belt at the waterline, and reinforced bow gave the vessel icebreaking capabilities. 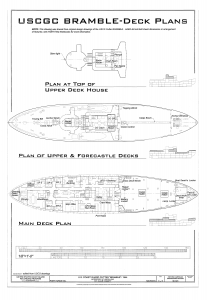 Extending the superstructure to the ship’s sides increased the interior volume above the main deck. A single propeller, turned by an electric motor powered by twin diesel generators, replaced the twin-screw arrangement. The 30,000 gallon fuel capacity gave the new design a range of 12,000 miles at a 12-knot cruising speed; at 8.3 knots the cruising range increased to 17,000 miles. 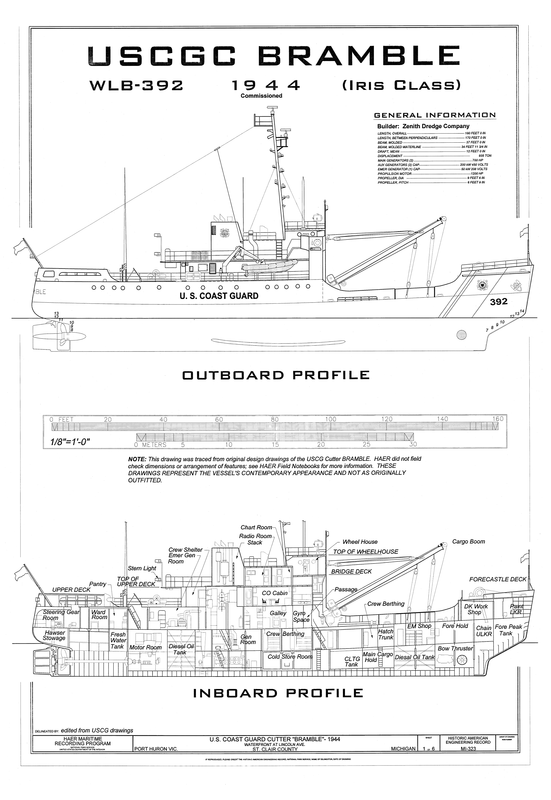 Finer lines at the bow and stern increased the new tender’s sea keeping ability in rough weather; an increase in draft also promoted seaworthiness. Numerous minor alterations increased the vessel’s utility as a SAR platform while deck-mounted guns and depth charge racks supported military duties. 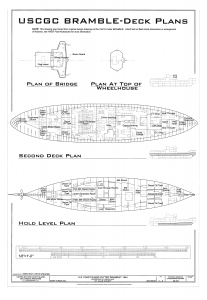 Six (6) “B” or Mesquite class vessels followed the thirteen (13) “A” or Cactus class vessels. 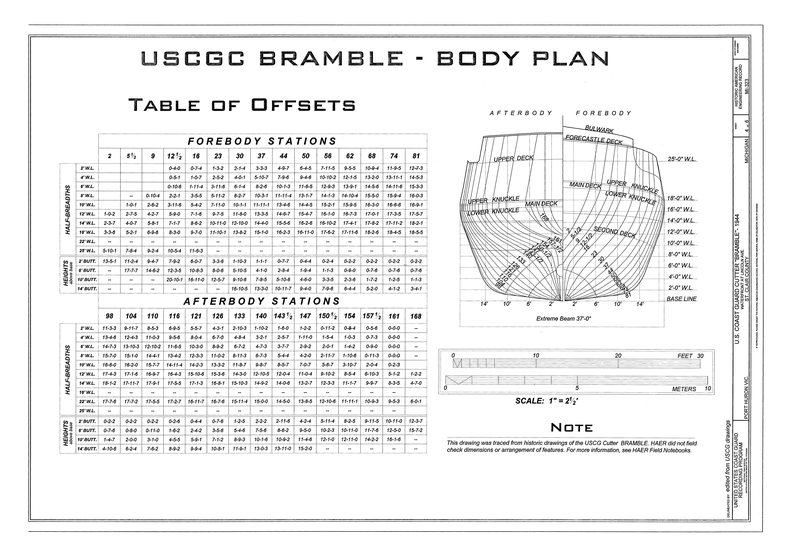 Twenty (20) Iris or “C” class vessels followed the Mesquite class, of which Bramble is one. The first launch of an Iris class vessel took place on June 18, 1943 with the final addition on May 18, 1944. The elapsed time from keel laying to commissioning on the Iris class vessel was an average of 269 days. All of the 180’s were named after trees, shrubs or flowers. This was a continuation of the longstanding lighthouse service practice of naming vessels after foliage found in the intended area of operation for that vessel. 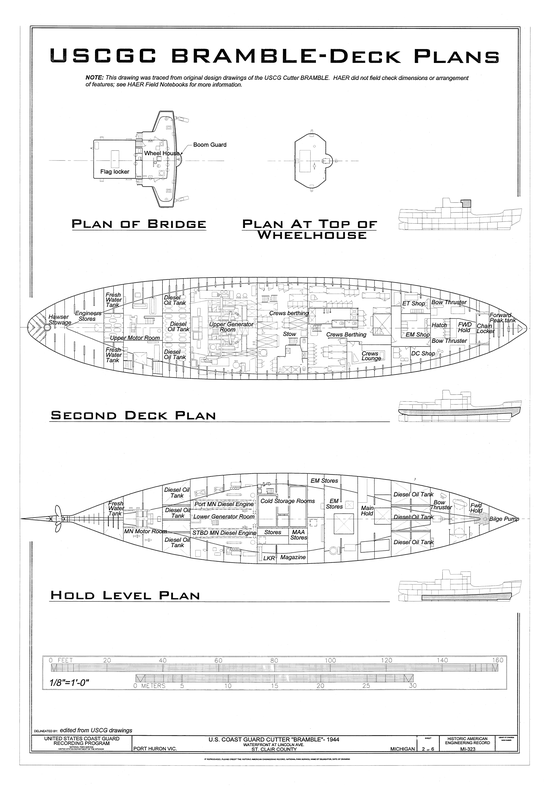 However, the Coast Guard did not have specific areas envisioned for the 180’s. 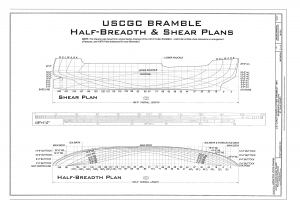 The Bramble was built by the Zenith Dredge Company, which was located at the foot of 13th Avenue West, Duluth, Minnesota. With the keel laid on August 2, 1943 and launched on October 23, 1943. Six months later the commisioning ceremony took place on April 22, 1944. With an initial designation of WAGL meaning “auxiliary vessel, lighthouse tender” which changed to WLB in 1965. The hull number remained the same from commission “392”. Significance: This vessel was built to serve as a 180′ U.S. Coast Guard cutter. 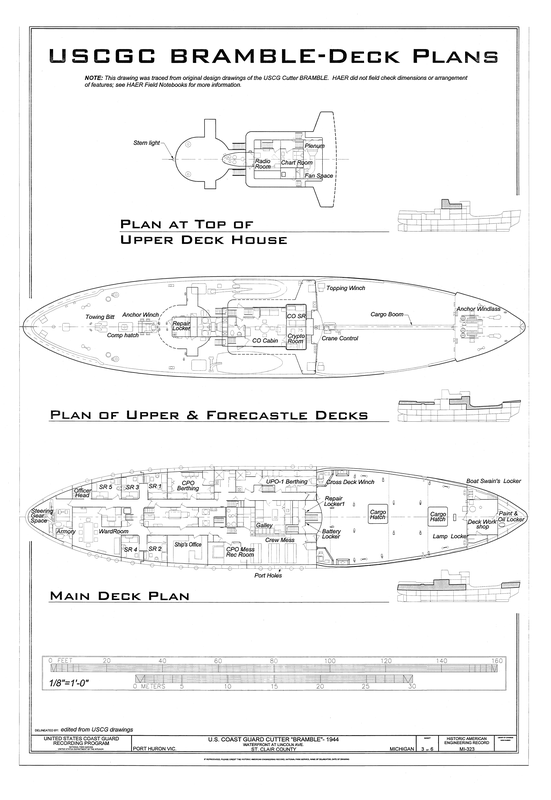 The federal government purchased or built thirty-nine of these vessels, built in three sub-classes, from 194 2-1944. 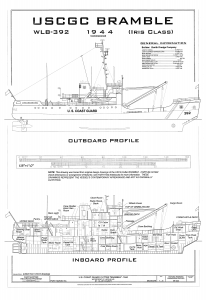 The United States Coast Guard (USCG) designed the 180s to service Aids-to-Navigation (AtoN), perform Search and Rescue missions (SAR), carry out Law Enforcement duties (LE), and conduct ice-breaking operations. Members of the class have served in the USCG from 1942 to the present. They have significantly contributed to safe navigation on inland and international waters in times of peace and war.